Performance at a value price. BLOCK-IT 380 Series fabric is Kimberly-Clark's newest film barrier fabric, offering great performance at a competitive price. 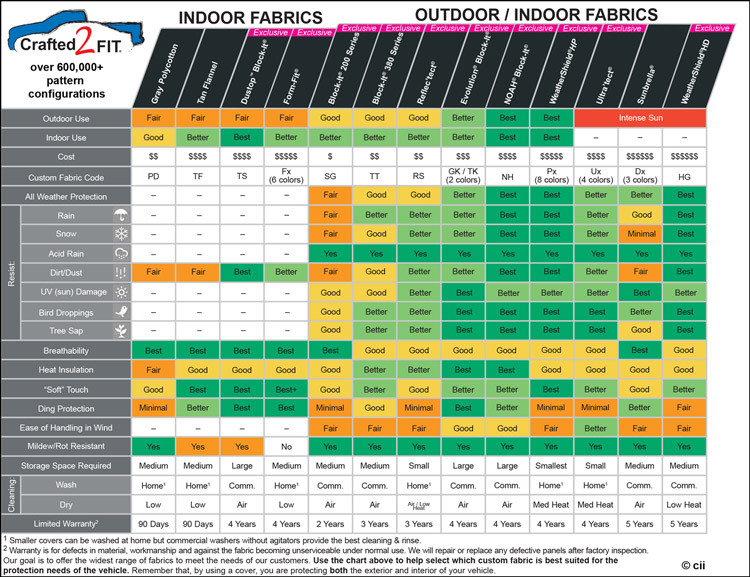 At 3.2 ounces per square yard it's about half the weight of the popular high-performance NOAH® fabric. The three-layer construction uses inner and outer layers of spunbond, sandwiching a middle layer protective film barrier. The film barrier has microscopic holes, smaller than droplets of water (and most dust particles) to stop moisture, but still allow any moisture vapor or heat to easily escape from under the cover. Dust / Pollution Barrier - The middle barrier layer acts as a filtration barrier against most airborne pollutants. Easy To Use - Won't shrink or stretch and retains it's tailored shape. Three (3) Year Limited Warranty - Against defects in workmanship and/or the fabric becoming unserviceable during normal use. 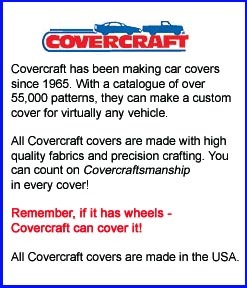 Covercraft will repair or replace, to the original purchaser, after required inspection. The Block-It 380 can be used indoors or outdoors. It’s lighter than the heavy duty Block-It 400 while still providing excellent protection in outdoor conditions. For garage or carport storage, the Block-It 380 has an inner dust barrier to keep paint-fouling contaminants away from your vehicle’s finish, even over lengthy periods of storage. For outdoor storage, the outermost layer resists moisture but is breathable to allow heat to escape. This fabric is available in custom and ready fit. Click on the order button below and follow the instructions to select your cover. Exact pricing will be displayed once you have selected your cover. Antenna openings – All Covercraft covers are made to fit vehicles with retractable antennas. If your vehicle does not have a retractable antenna, you will need to make a small opening in the fabric. Please indicate in the comment box of your order that you need an antenna grommet and we will be happy to send you one at no extra charge. Mirror pockets – If your vehicle was manufactured before 1965, the cover you receive may not have mirror pockets, even if it is a custom cover. If the pattern for your particular vehicle does not include built-in mirror pockets, we can send you mirror pockets for free, but they will not be sewn into the cover. Call us for details. This only applies to pre-1965 models. If your vehicle was made after 1965, your custom car cover will have mirror pockets already sewn into the cover. The Block-It 380 Deluxe is available in taupe. Due to manufacturer delays, please allow 3-4 weeks for delivery. Car Cover Storage Bag – Fold up you cover and keep it neatly tucked away in the trunk or garage. This bag will keep it clean and dry. Car Cover Lock – Thread the vinyl-coated cable through the cover’s grommets and attach the lock to secure the cover to your vehicle and deter thieves.